The Marginalia are currently being extended to the 1709 - 1726 period. The content team is proud to announce that more than sixteen thousand new entries have been added to the marginalia database of the Daily Journals of Batavia Castle. The additional marginalia provide an index to the 1709-1626 Daily Journals. New ship names have been identified and added to the existing index of ship names. We have now published more than 55.000 entries covering the 1682-1726 period. . Currently the content team is working on the 1726-36 decade. It is expected that all marginalia for the whole 1682-1806 period will be published on this website by mid-2014. The additional marginalia provide an index to the Daily Journals of the years 1709 to 1726. Also new ship names are extracted and added to the already existing index of ship names. We have published more than 55.000 entries now that cover the period of 1682 to 1726. Currently the content team is working on the next decade from 1726 to 1736. 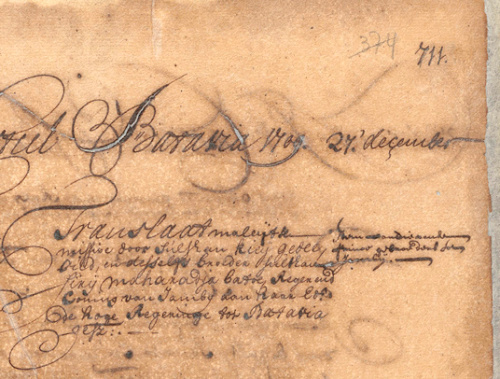 It is expected that all marginalia from 1682 to 1806 will be published on this website medio 2014.